A while back I bought a new small flat screen TV for my bedroom. My wife wanted one so she could watch and listen to the TV while in bed, before rolling over to sleep. After a few months of use, she noticed that the TV would often not respond to the infrared remote. I too noticed that you had to point the remote directly at the TV to get it to change a channel. When new, the remote would be able to do the same channel change while pointing at the ceiling. I took the remote down to the basement lab and cracked it open. 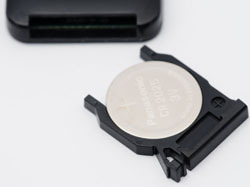 The Infrared remote uses one 3v lithium coin style battery for power (see photo below). 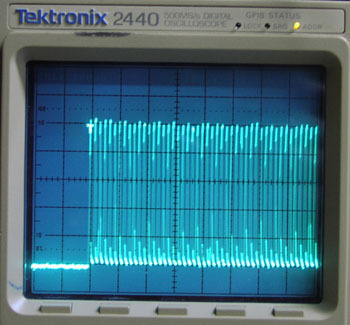 With the weak battery still in place, I pointed the infrared LED at a light detector circuit and captured the waveform of the light being transmitted. The signal produced by the unit is shown below. 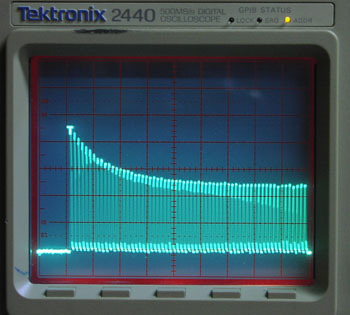 Note that there is a significant Amplitude droop in the signal. When activated, the unit draws a sufficient amount of current from the battery that the voltage drops from the normal 3v open circuit voltage to something much lower. This battery voltage drop produces a corresponding gradual drop in infrared light pulse Amplitude. In the fringe of the remote’s operational range from the TV, that signal may be too weak. This droop will also becomes more pronounced as the battery ages, due to the increase in internal resistance of the battery. Can anything be done to counteract this? Sure! A constant current LED driver could be included in the driver design, so battery voltage would not have much effect on the light output, until the battery is nearing the end of its life. Another easier method would be to install a small supercapacitor in parallel with the battery. When looking at the inside of the remote, it looked like there was room on the bottom of the remote’s circuit board to add a thin super capacitor, so I opted to try that. I installed a 0.2 farad capacitor with a 3.3v rating from Panasonic across the battery input. Once installed, the remote’s light output signal was nice and flat for the first 100 milliseconds or so. That would be plenty of time to send several commands.